David Afrasiab Assad Bakhtiari who you most likely always refer to as David Bakhtiari showed signs of making a living out of football right from his high school days. He developed further in college after which he landed a contract to play in the National Football League (NFL) with the Green Bay Packers. Here is more on his bio and how he has successfully taken each step towards success in his chosen field of career. David Bakhtiari is of Iranian and Icelandic descent. He was born in San Mateo, California on September 30, 1991. His parent’s names were given as Debbie and Karl Bakhtiari and we know that his father (Karl) runs a real estate business in California. David has as his elder brother Eric Bakhtiari who played college football with the University of San Diego and the Tennessee Titans in the NFL. As he came of high school age and having passed through elementary school, he got enrolled at the Junípero Serra High School in San Mateo, California where he began playing football more than he has ever done before. David Bakhtiari was the team captain in his second year and was named in the All-Metro (Bay Area), All-West Catholic Athletic League and All-San Mateo County. After high school, he signed his letter of intent to play college football with the Colorado Buffaloes football team of the University of Colorado where he majored in communications. Bakhtiari was with the Colorado Buffaloes football program from 2009 to 2012. He was redshirted in his first season with the team, but coming to his second season, he started 11 games in the season and gradually solidified his place in the team. The lad was named Freshman All-American honors by collegefootballnews.com and member of the All-Big 12 second-team for Academics. By the end of the next season, he was named a member of the All-Pac-12 second team by Phil Steele and the league’s coaches. In his penultimate season, David started 11 games just like in the two previous seasons, and when the season wrapped up, he was named to the preseason first-team All-Pac-12 squad, and for the second year in a row, he got a mention in the second-team honors by the league coaches. Coming into the 2013 new year, he announced on January 8, his decision to forego his senior season at Colorado and enter the 2013 NFL Draft. In the draft, as a 109 overall fourth-round pick, David Bakhtiari joined the Green Bay Packers. For an ACL injury starting left tackle Bryan Bulaga suffered, David saw himself being listed as a starting left tackle following his impressive performance in the teams training camp. Bakhtiari then went on start every game of The Green and Gold becoming the first rookie to do so since the introduction of the 16-game schedule in 1978. Coming into his second professional season, David Bakhtiari did not relent in improving and being at the top of his game for which reason he got a four-year contract extension worth $48 million inclusive of $16.7 million guaranteed and a signing bonus of $15 million. David Bakhtiari was named to the NFL second-team All-Pro squad in 2016 and 2017 consecutively. David Bakhtiari was born into a family of diehard San Francisco 49ers and grew up as a fan of the club. His brother Eric Assad Bakhtiari played for the team as a linebacker. The names of his other siblings are Andrew Bakhtiari (Brother) and Danielle Bakhtiari (sister) who are both doing well in their respective careers. 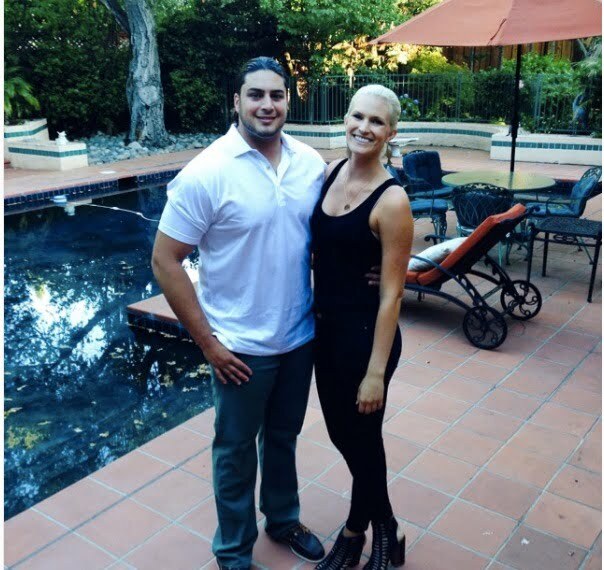 Their parents are Debbie and Karl Bakhtiari. The Packers’ starting left tackle from San Mateo, California has got for himself a belle who plays volleyball and is called Kerra Schroeder. Standing at 6 feet tall, she played volleyball at the University of Colorado Boulder but saw her intent of playing as a pro drifting away with a severe injury she sustained. Nevertheless, Kerra came back to the sports after her college career and plays as a pro today. She plays professionally for the French team, VCMB France. The relationship between the two hasn’t been giving much media attention or perhaps it’s been shielded from such. David Bakhtiari following his contract extension with the Green Bay Packers earns a base salary of $1 million. David Bakhtiari towers above many at an impressive 6 ft 4 in (1.93 m). At this height, the footballer weighs a heavy 310 lb (141 kg) which is apt to perform his duties in the NFL as an offensive tackle.